If anyone else wants to exercise their inner blogger, just email me and I'll add you. Pick'em peeps, welcome back or welcome in (whichever applies). 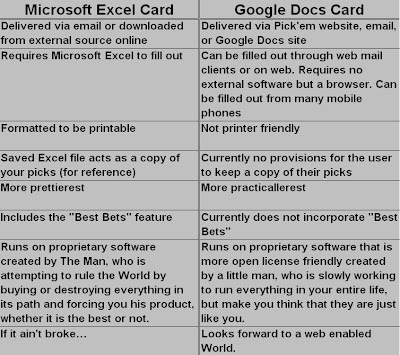 After our card format poll, the Google Doc card won by a landslide. That means I've mothballed the old Excel format and I'll be adding features/functionality on the fly this year. But from a game picking perspective, things are the same. - NCAA games are picked against the spread (NFL will be straight up). - Remember to check for bonus questions. I give away bonus points for answers, but these points DO NOT count toward your overall pickem score. To win the pickem contest, you have to have picked the most games right. Simple. - For those that have played before, Best Bets are out for now. There is not an easy way to incorporate them into the Google Doc card. - All picks are due before the kickoff of the first game. However, if you forget, still send me the card dude. I'll give you credit for any game kicking off after I receive your picks. Early bird bonus points (sending your card in early) will not be given out at the moment. If any of you know someone who may want to play, send them the link to the blog post or the card. Filling out the card is every person's official commitment. We'll talk entry fees in the next few weeks. Without further ado, here it is... the first card of the 2009 football season and a jump into a whole new world of formatting for me and filling out your cards from your iPhones for (some of) you. NOTE: We have Thursday games on the card this week. This means you need to get your picks in before Thursday night at 6PM Central. Again, if you are late, you can still send me your card... you'll just forfeit any games that kicked off before you submitted the form. I'm considering a significant change in the way games are posted and the way you will pick games, but the decision is tough. The two options are very different from one another, and the strength of each are unmatched by the other. Therefore, I'm going to call for a vote and we'll do this democratically. The vote will only be open for a few days, so if you want to weigh in, then get to it. Below is a "Ben Franklin" on the two options. Here are links to examples of the two cards. The Excel link is just a screen capture. Pretend its a real spreadsheet for the purposes of this excercise. Check them both out and then vote in the poll below. Fantasy football is a fantasy sports game in which participants (called "owners") are arranged into a league. The person who creates the league is called the commissioner, and that person invites other owners into his/her league. Each team drafts or acquires via auction a team of real-life American football players and then scores points based on those players' statistical on-the-field performances. A typical fantasy league will employ players from a single football league, such as the NFL or an NCAA division. Leagues can be arranged in which the winner is the team with the most total points at the end of the season, or in a head-to-head format (which mirrors the actual NFL) in which each team plays against a single opponent each week. At the end of the year, win-loss records determine league rankings or qualification into a playoff bracket. Most leagues set aside the last weeks of the regular season for their own playoffs. Or... at least that is what Wikipedia says. Kirby, of red spot on the carpet fame, of drunken Tribond master fame, of spotting celebrities at boxing matches fame, of... ok, you get the picture... Kirby has started an NFL fantasy league over at Yahoo. This post represents my endorsement of the idea. For anyone who wants to join, below are the deets. You have been invited to join Kirby's custom league in Yahoo! Sports Fantasy Football, The Ferm. I think y'alls know what yous need to do now. I hope this message finds you doing well. I’ve been trying to think of a way for us to get back in touch for this upcoming football season. I know it’s been many months since you last heard from me, but, due to my deep depression regarding the way the football season ended last year (well, mostly the fact that it ended), I’m just now beginning to recapture some of my thirst for life. The off-season has brought much change in my life. I can't think of anything in particular right now, but I'm sure there was a lot. Sometimes change can be uplifting, and I've never been adverse to change. Last year, our Pick'em game evolved from an email only thing to blog format. It pleases me to announce even more (uplifting) changes this year. First of all, I have made the site a little more legit by registering a domain name: http://www.pickem-football.com. The site was also given a complete face lift. You'll notice we are lightening up this year, as I've converted from a depressing black background theme to a more custom and inspirational white background theme. Expect more do-hickies, thing-a-ma-bobs, and doobers soon, but for now there are new sidebar widgets and even an ESPN ticker at the bottom. You should be able to follow along by web, email, RSS, and even our own Twitter feed (@pickemdashfb). It is a lighter and brighter world now for the Pick’em league. The memories of Pick'ems past will now be preserved forever at pickem-football.com. But hopefully distance and time have not broken our bonds forever. Remember how I used to send you guys a spreadsheet every week consisting of 15 NCAA games and all the NFL games of the week (usually 14-16)? The NCAA games were chosen against the spread, while the NFL games were picked straight up. Those were good times. But there was so much more. Each card usually contained bonus opportunities that were tallied separately for college and pro games. Bonus points were given for things such as weekly winners, sending the Pick’em card in early, bonus question answers, etc. These points accumulated throughout the season and were used in the post season contests. These components will no doubt be included in this year's competition. Remember when weekends had meaning and purpose? Four contests... over four months of meaningful life. All for the low cost of $25. "$25?" I know what you are thinking: “In this economy...” Uhhh STOP right there. You don't have to pay me right away if you don't want. I just need the money by the end of the year to send to the winners. The football season is long my friends. We just don’t have a “try before you buy policy.” If you start the season, you will be expected to pay. So how much is $25? We play for over twenty weeks, so you can probably fish a buck a week out of a fountain somewhere or off of a Buddha at a Thai restaurant if you need to… this is a bargain. Like always, I’m open to suggestions on ways to make this thing better. Hopefully all the peeps that played last year will be back in this year. Pat yourselves on the back. We have had a pretty friggin’ good group in recent years. If you are ready to commit yourself to a wild ride of Pick’em fun from September to early January, email me at commish @ pickem-football dot com. Yep, that’s right. The new site comes fresh with a gmail powered web email addresses. If any of you guys want to have one to use for league emails (or whatever), let me know and I’ll hook you up. "Play? For 25 bucks? No, we will decline; and we will watch football leisurely"
What!? Play and you may lose. Decline and you will not -- at least for a while. And watching SEC games on ESPN many years from now, would you be willing to trade all the seasons from this season so that for one chance, just one chance to have come back to pickem-football.com and tell your Pick'em league peeps that they may take your $25, but they'll never take your love for the game (and your freedom either)! Wow! Thanks guys... I feel much better now. Pick'em is back yo! PS - Tell your friends and stuff. We could always use new friends.